Could the British burial ground of Sioux warrior have been found? In 1887, Buffalo Bill and his Sioux warriors visited the British city of Salford (right next door to larger Manchester) with his famed Wild West Show. Whilst in Salford, a Sioux warrior known as Surrounded By The Enemy died from a chest infection (probably caused by the weather) in his teepee at Salford Quays. Chief Red Shirt of the tribe became a favourite with Queen Victoria, who was celebrating her Golden Jubilee (she came to the Throne in 1837). Many people in Salford today could be the descendants of some of these Native Indians. Could building site be burial ground of the lost warrior from Buffalo Bill's show? The Salford Quays in the city of Salford today, 120 years after Buffalo Bill and his tribe of Sioux Indians visited. Surrounded By the Enemy died from a chest infection in these quays in 1887. At 6ft 7 inches tall, the imposing sight of the Sioux warrior on the battlefield would have been enough to instil the enemy with fear. In 19th Century Salford, the towering warrior with his solemn name Surrounded By The Enemy was a source of fascination and mystery. Surrounded, as he was better known, succumbed to a chest infection in his teepee on the chilly Salford Quays in 1887 and died. His body was taken to Hope Hospital, where it promptly vanished. There was no official burial, there is no record of it being moved, and nobody admitted to taking it. Now, 120 years later the mystery may yet be solved, with the start of excavations on the site that experts hope might just uncover the once impressive warrior's final resting place. It was in November of 1887 - during the reign of Queen Victoria - that Surrounded left his South Dakotan homeland to make the long journey to Britain with Buffalo Bill's famed Wild West Show. The horseman, a member of the Oglala Lakota Warriors, had been recruited by the American army scout, who formed a travelling company of 97 Native Americans, 180 bronco horses and 18 buffalo. To the people of Salford and Manchester it must have seemed the greatest show on Earth as Buffalo Bill's Wild West and Congress of Rough Riders of the World Show (to give it its full name) set up camp on the freezing banks of the River Irwell, staying for five months. The British tour had started in London where Queen Victoria, in her Jubilee Year, demanded several performances and adored the chief Red Shirt. It stopped at Birmingham before reaching Salford. They performed nightly to vast crowds, staging a 'Cowboys and Indians' show of classic gunslinging and acts of horsemanship in a massive indoor arena built on what is now Salford Quays, two years before the canals were even built. The company raced their broncos against English thoroughbreds over a 10-mile course. The broncos won with 300 yards to spare. Sadly for Surrounded - thousands of miles from home - it was to be the site of his death when aged 22 he died of a lung infection. Despite the mystery over his resting place, it thought he was probably buried in a traditional Sioux ceremony conducted by fellow famed warriors Black Elk and Red Shirt. They too were Lakota (northen) Indians from the Oglala tribe of the Sioux Nation - who counted Sitting Bull and Crazy Horse among their numbers. Many of the Sioux were veterans of the Battle of Little Big Horn - where General George A Custer had his last stand. Salford was a long way from the Old West, but all the better for some of the Sioux, who found themselves on the run from the US cavalry because they had been involved in the demise of Custer and his Seventh Cavalry. Black Elk, a medicine man, and later a Roman Catholic, was interviewed in 1931 and a subsequent book, Black Elk Speaks, became a classic of Native American writing. 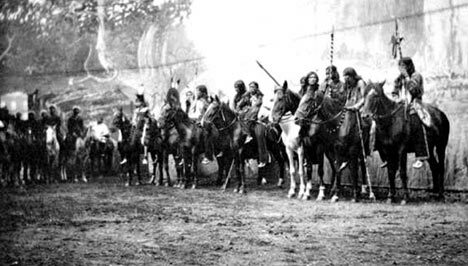 Black Elk and several other Sioux visitors found themselves lost in Manchester and had to make their own way back to South Dakota when the show departed. Many years later in 1990 the Oglala Sioux were depicted in the 1990 film 'Dances with Wolves'. Salford councillor Steve Coen is hoping that work on the foundations of a new BBC centre will uncover the remains of Salford's remaining Sioux warrior and finally solve the riddle of Surrounded. He said: "He was the only member of the tribe to die while they were in Salford and his official records can still be traced today. "But his body was never recovered or recorded in a church burial and it is rumoured that it could still be somewhere in the Salford Quays area." Mr Coen, who has visited the Oglala tribe, plans another visit to the Rosebud Reservation, South Dakota, to try to trace the descendants of the 'Salford Sioux'. He believes that there may be people living in Salford today who have Native American ancestry. "It is possible there may be descendants as they were here for a long time and they were certainly friendly with the local population," he said. One Sioux baby was born in Salford and was baptised in St Clement's Church before slipping out of the history books. The Sioux connection still lives on in Salford, with street names such as Buffalo Court and Dakota Avenue. When there were not enough buffalo left to hunt, William Cody turned to showbusiness. The man nicknamed Buffalo Bill joined forces with another legend, "Wild Bill" Hickok, and formed a travelling circus. In 1870 he created Buffalo Bill's Wild West and Congress of Rough Riders of the World and the show took off. He was invited to England in 1887 to be the main American contribution to Queen Victoria's-Golden Jubilee celebration. The entertainment always started with a parade and ended with a melodramatic reenactment of Custer's Last Stand, with Cody playing Custer. 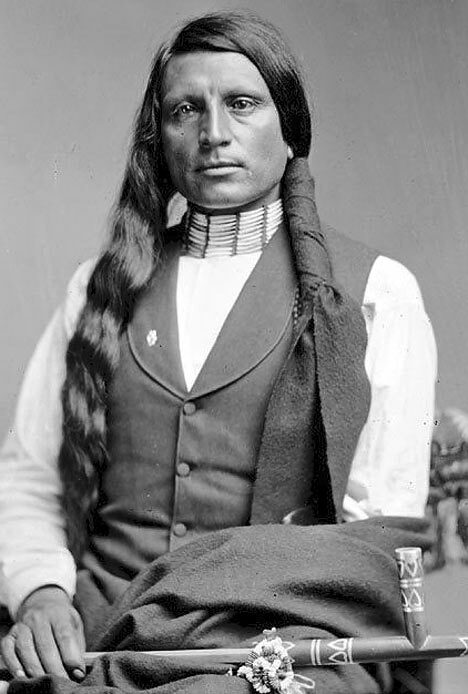 In some performances Sitting Bull, who wiped out Custer, played himself. Other stars included Annie Oakley, who put on shooting exhibitions with her husband Frank Butler. Buffalo Bill died peacefully in 1917. Last edited by Blackleaf; Aug 16th, 2007 at 12:53 PM..
Re: Could the British burial ground of Sioux warrior have been found? Fascinating! Poor Surrounded. Probably the worst country to be in and have an infection back then.